8" + 1" 200 watts RMS 2 way speaker cabinet. Based on the broad experience of Audio Engineers, DJ's and Musicians, the design team at Quest Engineering combined knowledge and practical solutions with the latest in manufacturing technology to create precise driver and design combinations that will deliver optimum results in both live and pre recorded music applications. The QS range contains four full range models ranging from a high powered 8" two way (QS150), to the 15" QS500. 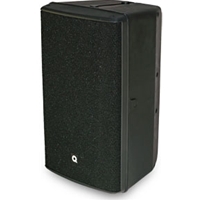 The QS Speaker System Range delivers exceptional bass response along with high frequencies that supply a balance of vocal intelligibility without instruments sounding harsh. Built in control- At the heart of the enclosures are a system optimizing circuitry to act as protection as well as sonic enhancement. A custom designed high slope network is engineered specifically to each model to "serve and protect". Solid construction - The ABS injection moulded case contains 25% more material than similar class boxes. This adds considerably to the structural integrity for both acoustic damping and road going strength. It all adds up to reliability and results - Good design, quality components and a network of audio specialists dealers. This is behind the Quest 3-year international warrantee. With Quest engineering you will never be "off the road". Quest Engineering products are only available from dedicated audio specialists with the experience and staff to consult and support all audio industry requirements.